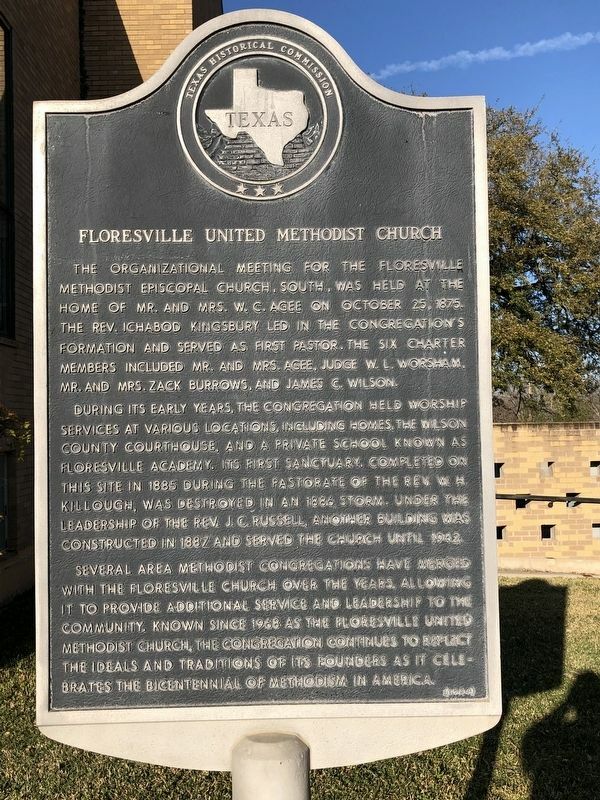 The organizational meeting for the Floresville Methodist Episcopal Church, South, was held at the home of Mr. and Mrs. W. C. Agee on October 25, 1875. The Rev. Ichabod Kingsbury led in the congregation's formation and served as first pastor. The six charter members included Mr. and Mrs. Agee, Judge W. L. Worsham, Mr. and Mrs. Zack Burrows, and James C. Wilson. 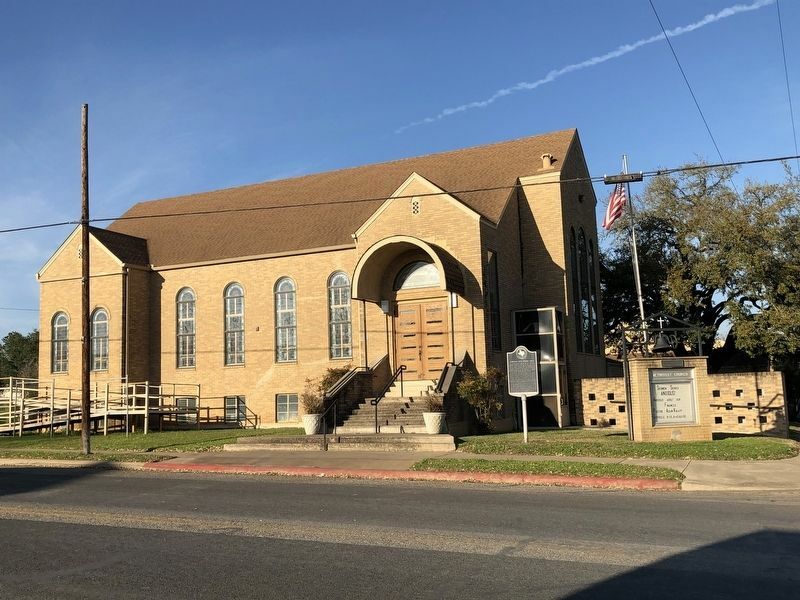 During its early years, the congregation held worship services at various locations, including homes, the Wilson County Courthouse, and a private school known as Floresville Academy. Its first sanctuary, completed on this site in 1885 during the pastorate of The Rev. W. H. Killough, was destroyed in an 1886 storm. Under the leadership of The Rev. J. C. Russell, another building was constructed in 1887 and served the church until 1942. Location. 29° 8.132′ N, 98° 9.488′ W. Marker is in Floresville, Texas, in Wilson County. Marker is at the intersection of 4th Street (Loop State Highway 181) and B Street, on the right when traveling north on 4th Street. Touch for map. Marker is at or near this postal address: 1205 B Street, Floresville TX 78114, United States of America. Touch for directions. Other nearby markers. At least 8 other markers are within walking distance of this marker. First Baptist Church of Floresville (within shouting distance of this marker); White House Café and Saloon (about 600 feet away, measured in a direct line); Captain Will Wright (about 700 feet away); Wilson County Jail (about 700 feet away); Wilson County Courthouse (approx. 0.2 miles away); The Flores de Abrego Family and Floresville (approx. 0.2 miles away); Wilson County (approx. 0.2 miles away); James Charles Wilson (approx. 0.2 miles away). Touch for a list and map of all markers in Floresville. More. Search the internet for Floresville United Methodist Church. Credits. This page was last revised on February 26, 2019. This page originally submitted on February 26, 2019, by Brian Anderson of Kingwood, Texas. This page has been viewed 30 times since then. Photos: 1, 2. submitted on February 26, 2019, by Brian Anderson of Kingwood, Texas.